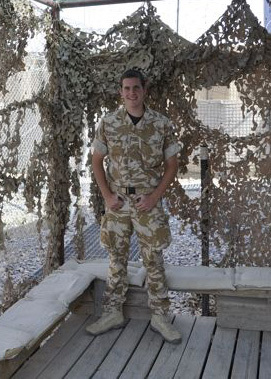 Signaller Chris Boulton is with 204 Signal Squadron, Main Troop, based in Lashkar Gah, for his six-month tour on Operation HERRICK 12. Here he writes about cricket and saying goodbye. Cricket, like Manchester United and Coca-Cola, can be found anywhere it seems. In parks, schools, on television and now from the sangers of the Lashkar Gah Main Operating Base, the locals appear to have got into the T20 spirit and started some early morning practice, often with more than one match running at a time. They seem to be good sports apart from the odd argument and scrap. It certainly makes sanger duty go a little quicker. On a tragic note I would like to take this opportunity to say goodbye to Signaller David Grout of 204 Signal Squadron, whose life was cut short only hours into his R&R. 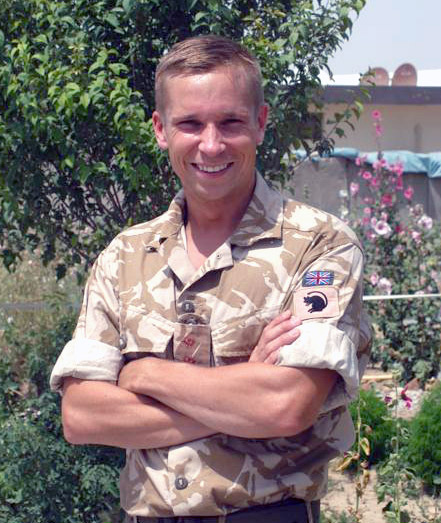 Dave was a trusted and reliable soldier to his friends and colleagues in the squadron, but more than that he was a top bloke who knew how to have a laugh but also got the job done. Our thoughts and prayers go out to his family. He will be missed but never forgotten. Sport in Afghanistan – cricket, volleyball and following the election! Signaller Chris Boulton is with 204 Signal Squadron, Main Troop, based in Lashkar Gah, for his six-month tour on Operation HERRICK 12. Here he writes about volleyball, cricket and his duties in Afghanistan. The past couple of weeks have been pretty hectic for Main Troop, because with a new Brigade comes new ideas. Our normal routine duties have been to provide communications for the Brigade staff and supply personnel for guard duties in the sangars and on the front gate. Both the day and night shift have also grafted to get the Operations room moved, cleaned up, rearranged, re-cabled and set back up again within a 24-hour period. It all went without a hitch and couldn’t have been done without the excellent teamwork between the communication systems engineers and operators. One of the highlights of the week had to be the launch of the Lashkar Gah Volleyball Ladder. Organised by Lance Corporal Bird, it is currently made up of 15 teams from different departments around the Main Operating Base. With two teams being submitted by Main Troop we should see some interesting matches in the future to say the least. The main topics of conversation this week were who would win the general election, Twenty20 cricket and the ash cloud causing havoc over Europe. Everyone in the Troop has “dug-in”, raising each others spirits, and it has helped with us being so busy within the Headquarters. Lance Corporal Nat Docherty is conducting comms testing on a Combat Logistics Patrol, whilst Corporal Wendy Cunington and Signaller Chris Boulton have been arranging a 10km run around Lashkar Gar in support of our charity drive for the Army Benevolent Fund. For far too long this week I have been stuck behind a computer screen. It’s the Squadron’s Grading Board for the Signallers on Tuesday for which I have written 13 reports. All of the Squadron’s hierarchy come armed with a red pen and scribble comments and corrections across all of my hard work. I can guarantee I will have put a few apostrophes in the wrong place. We manage to keep reasonably up to date with events back home and have just heard that there may be a volcano due to erupt in Iceland, and Michael Jackson may be ill! Whilst the newspapers that we get are infrequent, we do get the headlines and big stories from Sky News which is constantly on in the HQ, although it’s the local news stories that I miss. Lately it has been all about the election, and discussing the hung parliament. Much like the Lord of the Rings saga, they kept us waiting and waiting. If I remember correctly the elves and dwarves ended up working together after being in opposition for so long, so maybe there are a couple of parallels although I am not sure where the ork army fit into all of this. We have had a couple of birthdays recently, of particular note Signaller Faye Tanner has turned 21 and can now be officially thought of as an adult! The Troop are now two months into the tour and we have started sending soldiers back to the UK on R&R for a well deserved break. With the football season over it is time to start talking about metatarsals, and heaping unrealistic expectation on the English football team. Friendly rivalry has already started with the Americans in the headquarters, and hopefully we can silence them (along with the Scottish) by winning the opening game of the World Cup, before limping out at the knockout stages to the Germans on penalties no doubt. 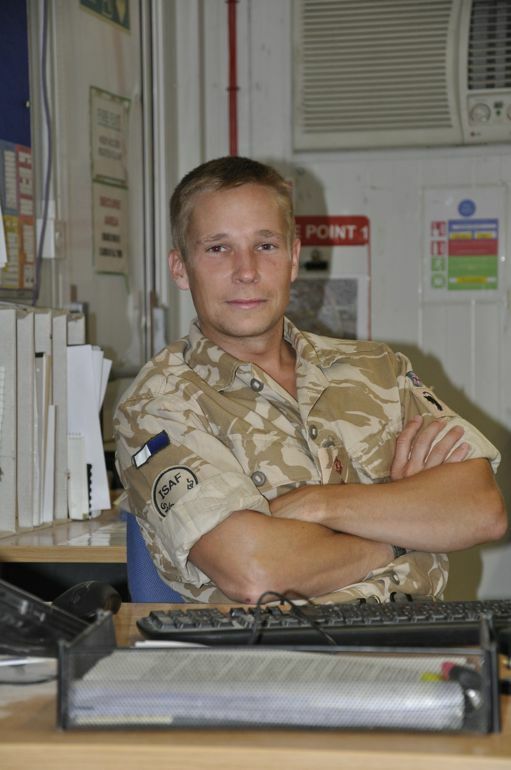 Captain Stuart Thomas is the Main Troop Commander of 204 Signal Squadron, based in Lashkar Gah for his six-month tour on Operation HERRICK 12. He writes about the fitness craze gripping Lashkar Gah. Me next to the flower garden in Lashkar Gah camp. Main Troop monitors all communications into Task Force Helmand Headquarters based in Lashkar Gah. We also have Information Systems Engineers (computer geeks) and technicians who look after the repair and maintenance of the numerous computer and radio systems. The Troop has been bolstered significantly, with two operators flying in from Catterick Garrison and a couple returning from their adventures on the ground. 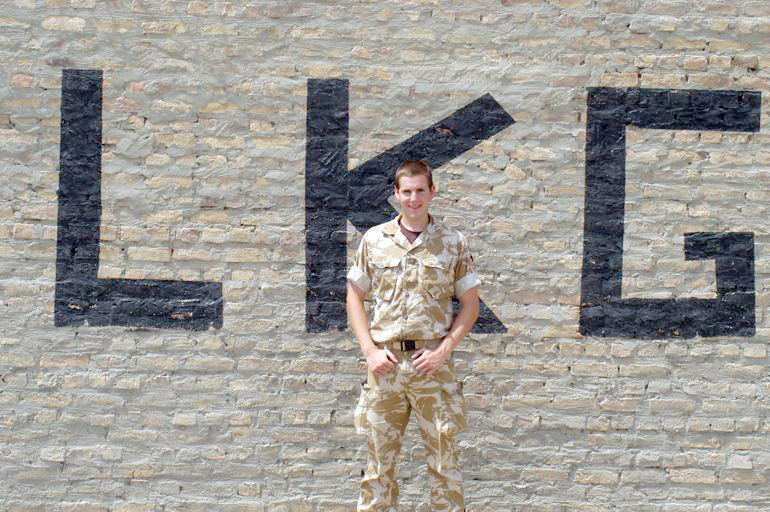 We’re trying to raise £10,000 for ABF – The Soldiers’ Charity. To kickstart the charity drive, we have been organising the Lashkar Gah 10km race which will take place this weekend (23 May 2010). A route around the camp has been cleared and competitors will run 12 laps across sand, stone and shale. So far about 80 people have signed up and pledged $10 each to run. Some of the troop have been training harder than others and some not at all! Now two months into the tour it’s working well as a weight loss programme for some. No need for gastric bands here. The heat, the weight carried by those out on the ground and the good gym facilities have allowed the guys to tone up in an attempt to get beach ready (beached whale perhaps?) for their loved ones back home. One of the Troop has lost over two stone so far (equivalent to a medium sized toddler? ), and by the end of the tour we are going to get one of those photos of him holding his previously tent-sized trousers, and he can wonder how he ever fit into them. The general election was followed closely, and much like the Olympics, everyone became an expert on all things they previously knew nothing about. If you don’t believe me wait until 2012 and listen to your parents discuss synchronized swimming, and shake their heads in disappointment when a diver attempts a triple pike and double back flip and makes too much of a splash on entry. I have been explaining over and over again what a Hung Parliament is. After the excitement we had that stewards enquiry (I know horse racing is not in the Olympics!) to find out the winner, and now everyone has lost interest.